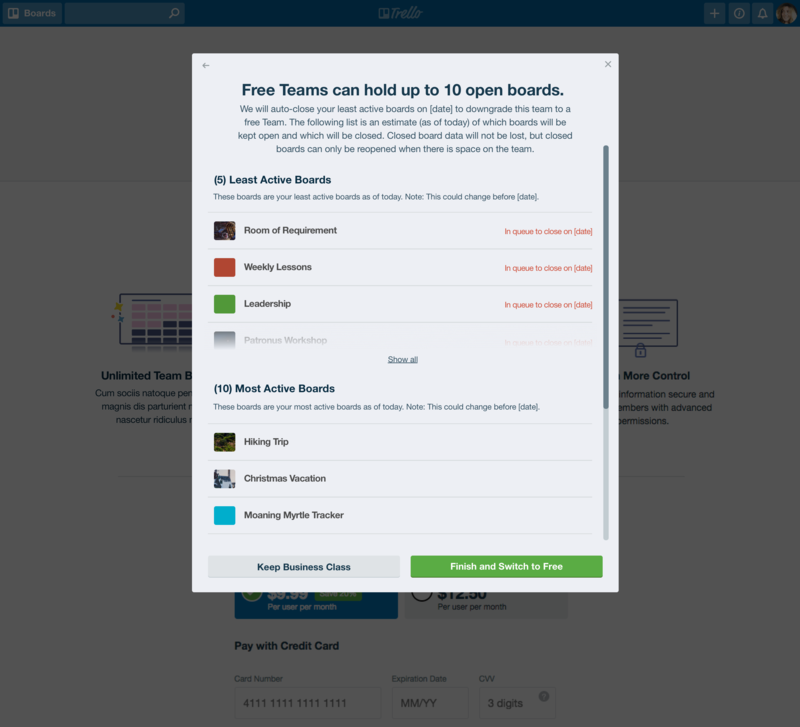 As of March 19, 2019, free teams in Trello can have up to 10 open boards, and can upgrade to Business Class or Enterprise for unlimited boards. Regardless of plan, all Trello users can continue to create unlimited personal boards, lists, and cards. This change only applies to boards within free teams. To learn more about how this policy change enables our investment in the future of teams, please visit our blog. To help ease into this change, existing free teams can add up to 10 additional boards until May 1, 2019 without upgrading to Business Class. After May 1, 2019, existing free teams with more than 10 open boards will continue to have access to their open boards, but will need to upgrade to Business Class to add more boards to the team. All Trello boards fall into one of three categories: Personal boards, Free team boards, or paid Business Class or Enterprise team boards. A board's current association is displayed at the top of the board to the right of the board's name and can be changed by clicking the badge and selecting a different association. Personal Boards Boards that are in an individual user's Trello account. Free Team Boards Boards that are in a free Trello team ( What are teams?). Business Class and Enterprise Team Boards Boards that are in a Trello Team that has been upgraded to a paid Trello product (Trello Business Class or Trello Enterprise). All Trello users have access to unlimited personal boards. A personal board is part of an individual user’s account and is typically used for projects that only require input from a single user or a small group of collaborators. A personal board’s visibility defaults to Private where the board can only be seen by invited members, or can be made Public where anyone on the internet can view the board: Changing the visibility of a board to public, private, or team. Free Trello teams can hold up to 10 open team boards at a time. Free team boards are typically used for projects that require collaboration from an entire Trello team or many members of a Trello team. Functionally, team boards work just like personal boards but can be set to Team Visible to allow all members of the team to view the board. There are several options for Free teams who want to create additional boards but are approaching 10 boards in their free team. 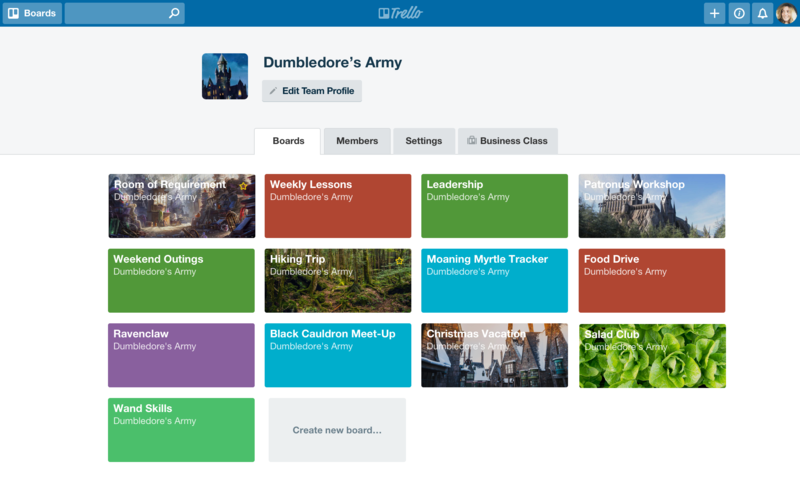 Upgrade to Business Class: As a team grows and uses Trello for more projects, it may need more than 10 boards and find value in the additional functionality in Business Class. Business Class teams get unlimited boards and collaboration features that take it to the next level: unlimited Power-Ups, enhanced access to automation with Butler, admin capabilities, collections, and much more. Close inactive boards: Have some boards hanging around gathering dust? Go ahead and close them. Closed boards can always be reopened if there is space available in the team. A team can have unlimited closed boards. Change a board's association to personal: Some boards may not require collaboration with an entire team, for example, a to-do list of a single team member. If the team doesn't want that board to count against the 10 boards their team can hold, then a team member can make it a personal board. On a team member’s Boards page, a team member will see all of the team boards they are a member of, but not the boards they are not a member of. Regardless of if a team member is added to all the team’s boards or not, when the free team has created more than six boards, all team members will see the number of remaining boards that can be added to the team on the “Create new board...” tile. On a team’s Boards page, a team member sees a tile for each of the team’s boards. If there are any team boards that are private and a team member doesn’t belong, they will see a placeholder tile saying it is a “Private Board”. Business Class and Enterprise teams can create an unlimited quantity of team boards and have access to additional features like unlimited Power-Ups, increased attachment sizes, and the ability to set up more intricate workflows. When a team downgrades from Business Class, it retains its Business Class features and unlimited boards until the end of its prepaid service period. 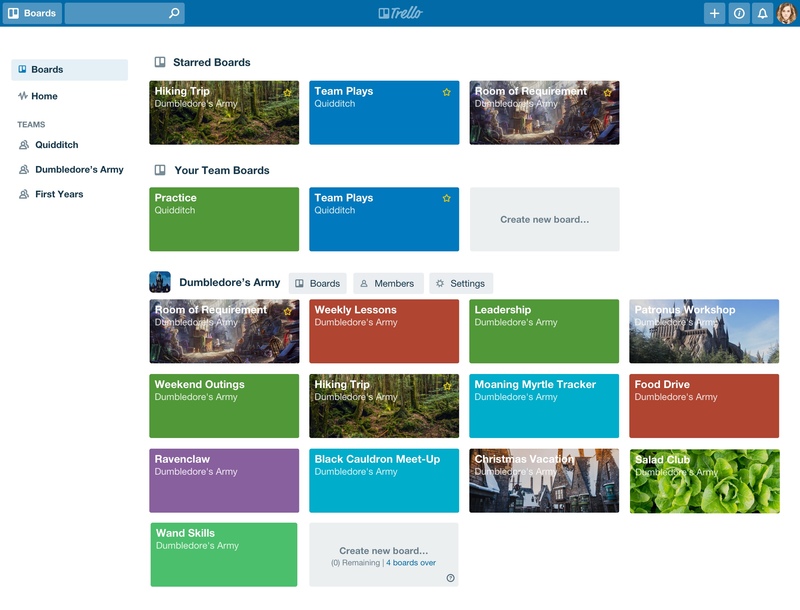 At the end of its prepaid service period, it becomes a free Trello team that can hold 10 boards. If a team member chooses to downgrade the team, that member will see a list of the 10 most active team boards that will remain open, while any other boards will be closed. To choose which boards are closed or kept open, extra boards can be closed prior to downgrading. On mobile devices, no one is allowed to add a board to a free Trello team if that team already holds the maximum allowable number of boards. Users on free teams with the maximum allowed number of boards cannot create a new board in that free team, move a board into that free team, or re-open a board in that free team. If a user is online and tries to take any of these actions, they will receive a message that they cannot take that action. In each of these cases, the user will not receive a message explaining why their action failed when they come back online. Please note: On older mobile clients (Android 5.6 and earlier, iOS 4.11 and earlier), if a user on a free team tries to take any action that would push them over the maximum allowable number of boards for a free team, the action will be modified in the same way as the offline case above, but the user will not receive a message telling them why they were blocked. We’re happy to help! Reach out to us on our contact page and we can explain any questions or concerns that you might have.